SINGAPORE (July 28): Singapore Airlines has reported a 180% surge in earnings, to S$257 million, for the quarter ended June 30. This was largely due to cheaper fuel, and a share of the divestment gain from its aircraft maintenance, repair and overhaul subsidiary SIA Engineering Co.
For 1Q17, the group's operating profit was 74% higher than the year before, at S$193 million. Group revenue for the period was 2% lower, at S$3.65 billion. 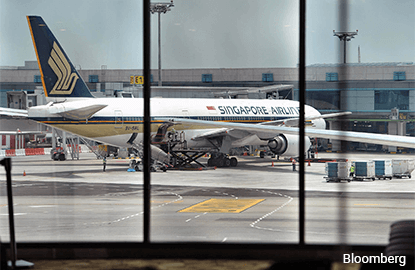 The group spent S$357 million less on fuel, as jet fuel prices as well as hedging losses were lower than in the year before. SilkAir as well as the two budget units, Scoot and Tigerair, performed well during the period. SilkAir recorded operating profit of S$27 million, compared with S$5 million the year before. Scoot reversed its operating loss of S$20 million last year, while Tigerair posted S$8 million in operating profit. The parent airline recorded an 82% jump in operating profit for the quarter, but revenue was down S$112 million, as weak passenger demand weighed on passenger yields. Indeed, SIA cautions that operating conditions for the parent airline "remains challenging amid economic weakness and geopolitical concerns in some markets." For the month of June, the parent airline saw passenger numbers and load factor decline from the year before, by 2.6%, and 2.1 percentage points, respectively. Only Scoot continued to see marked improvements in its operations; its load factor edged up, as the increase in the number of passengers carried still outpaced capacity growth of 57.7%. Scoot, SilkAir and Tigerair saw growth in passenger traffic in April and May, but the parent airline saw weak demand in all its markets, except East Asia. Shares in SIA have gained more than 5% over the past month in the lead-up to the financial results. It closed at S$11.20 on Thursday, at 14.5 times forward earnings, with a dividend yield of 4%.